Melt butter in a 2-quart heavy saucepan over moderately low heat, then add flour and cook over low heat, whisking constantly, 3 minutes. Add milk in a stream, whisking, and bring to a boil, whisking. Reduce heat to low and gently simmer, whisking occasionally, 10 minutes. Remove from heat and add “3 cheeses”, whisking until melted, then whisk in salt, pepper, and nutmeg. Remove from heat; keep warm in a hot water bath. Note: This sauce will hold for 3-4 days or use it up in homemade macaroni & cheese…yum, yum! Beat together eggs, cream, salt and pepper in a bowl with a fork until combined. Heat omelet pan over moderately high heat until hot, then add 1 tablespoon butter and heat, swirling pan, until foam subsides and begins to brown near edge of pan. Pour beaten eggs into skillet, then cook, shaking pan back and forth quickly with one hand while stirring eggs in a circular pattern with a heatproof rubber spatula with the other hand, until eggs begin to set. 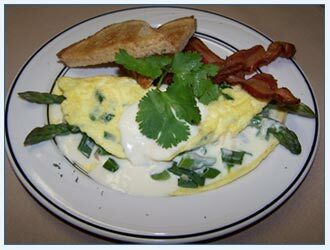 Quickly spread set eggs evenly in skillet and sprinkle with cheese, asparagus, scallion & cilantro leaves, and then cook until omelet is just set, about 30 seconds to 1 minute. Add about 1/3 cup Mornay sauce across center of omelet. Holding handle of pan near you, lift edge of omelet closest to handle using a rubber spatula and fold one third of omelet over filling. Grabbing handle from underneath, tilt pan over plate until unfolded part of omelet slides onto plate, then immediately invert skillet, as if trying to cover plate, to make omelet fold over itself onto plate. Drizzle additional Mornay sauce over top and garnish with chopped cilantro. Serve with your favorite toast and breakfast meat…Bon Appetit!